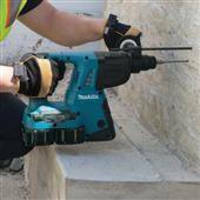 Makita is bringing new solutions to the concrete and masonry industries' biggest annual trade show next month in Las Vegas. World of Concrete lands at the Las Vegas Convention Center on February 2-5, and Makita will be exhibiting at the outdoor Silver Lot area (booth O30043) with a dynamic, hands-on booth experience. Makita will offer attendees plenty of opportunities to try out the industry’s best technology for concrete forming, drilling, surfacing, chipping, and breaking – all with less noise, lower vibration, and better dust extraction. There will also be tool drawings and more surprises. For reduced vibration, a padded handle just doesn’t cut it. Makita Advanced Anti-Vibration Technology (AVT®) is a synchronized three-component system that includes an internal counterbalance to reduce vibration, giving users the industry’s lowest vibration levels without sacrificing performance. Makita’s expanding AVT® line-up includes a solution in every major concrete hammer category – from 1” to 70 lb. – and attendees will have the opportunity to experience the difference for themselves. One demonstration will allow attendees to run the Advanced AVT 70 lb. Breaker (HM1812) against a 60 lb. pneumatic hammer (the video below captures the side-by-side match-up, with one clear winner). Go here for more on Makita AVT. Makita created the 18V Lithium-Ion cordless tool category in 2005. Today, with over 100 tools, Makita has the world's largest 18V cordless tool line-up powered by 18V Lithium-Ion slide-style batteries – and the line-up includes a growing range of solutions for concrete applications like formwork, fastening, drilling, cutting, surfacing, lighting, and clean-up. For the most demanding applications, select Makita 18V X2 LXT® (36V) tools are powered by two 18V Lithium-Ion batteries, so users get 36V power, speed and run-time without leaving the 18V battery platform. A range of 18V cordless solutions will be on demonstration for attendees to try for themselves. For more on the world's largest 18V cordless tool line-up, go here. Engine seizure due to improper fuel and oil mixing is one of the most common failures of 2-stroke power equipment. Makita is delivering a better solution with MM4® 4-stroke engine power equipment, and for contractors the line-up includes the world’s first 4-stroke engine power cutter (EK7651H), as well as backpack and handheld blowers. These efficient 4-stroke engine solutions go beyond exceptional tool performance, as they require no fuel mixing so users require only one gas can for all their power equipment in the truck. In addition, Makita MM4® 4-stroke engines run quieter, idle smoother, have lower emissions, and give users quicker and easier starts. Attendees will be invited to try out MM4® 4-Stroke Engine solutions at the Makita booth. Go here to learn more about Makita MM4. Makita is a leader in solutions for formwork including an expanding line-up of air compressors and pneumatic nailers as well as circular saws, reciprocating saws, and more. World of Concrete attendees will have the opportunity to see and experience these best-in-class tools.